The San Francisco Bay Area Chamber Choir was founded in 1978 and sings under the direction of Ofer dal Lal, who was named the choir’s new Music Director in June 2017. Since its origin, the choir has been highly acclaimed for its sensitive and exciting performances of extremely varied and demanding literature. The choir was initially founded by Dr. Harry Carter, then Director of Choral Activities at California State University Hayward, now California State University East Bay. Dr. Carter led the choir until his retirement in 2003. Dr. David Stein, Professor Emeritus of Music and former Director of Choral Activities at California State University East Bay, succeeded Dr. Carter as the choir’s Music Director and led SFBACC from 2003 until his retirement in 2010. Anthony Pasqua became the Music Director in 2011 until he relocated in 2017. The choir continues to specialize in a cappella works of masters of the past and significant modern composers. The group has also performed large-scale works with orchestra and a variety of lighter works including American folk songs and spirituals. The choir’s repertoire has ranged from Renaissance and Baroque choral works to the lush Romanticism of Brahms and Bruckner, to the 20th century works of Schoenberg, Stravinsky, and Penderecki, and to works of local composers such as Kirk Mechem, Donald Aird, David Conte, and Frank La Rocca. Although its concerts are usually a cappella, the choir has performed with piano and organ and with the Oakland Symphony Orchestra. The choir usually maintains a roster of 40-45 singers. About half of the choir members are church or synagogue musicians or music educators; the rest work in fields such as medicine, accounting, teaching, and computer programming, but are also very highly skilled and dedicated musicians. Several members of the Cal State East Bay Music Faculty have been choir members over the years. In addition to regular performances in the San Francisco Bay Area, the choir has made 12 European concert tours with performances in 18 countries including participation in 6 EUROPA CANTAT festivals and the 1992 Zimriya International Choral Festival in Jerusalem. 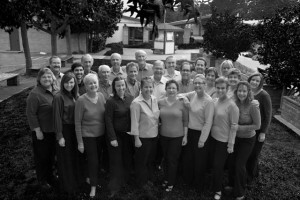 In 1994, the choir was invited to perform at the Western Division Convention of the American Choral Directors Association in Sacramento, California, and received rave reviews. Singers come from all around the Bay Area. The choir usually rehearses at Faith Lutheran Church in Castro Valley on Sunday evenings from 6-9 PM.